The Norcold, Inc. refrigerators listed below have been recalled. It is important to implement this safety enhancement to prevent an unsafe elevation in the temperature of the cooling unit should the unit fail in operation. This enhancement seeks to minimize the risk of injury or death due to fire. Norcold Inc. has decided to recall certain 1200, 1201, 1210 and 1211 model gas/electric refrigerators with serial numbers from 315525 to 13088811, non-consecutively. The refrigerator’s model and serial number are located inside the fresh food compartment. These refrigerators may have cooling units with a cooling unit serial number between 700000 to 13085759. This is a new recall campaign to include all 1200, 1201, 1210 and 1211 models. Even if your refrigerator was repaired as part of a previous recall, it is necessary to have it repaired again to minimize the risk of injury or death due to fire. Identify and write down the refrigerator model. If it is a Norcold 1200, 1201, 1210 and 1211 model, go to step 2. Identify and write down the refrigerator serial number. If the serial number falls in the range of 315525 and 13088811, go to step 3. Identify and write down the cooling unit serial number. If the serial number falls in the range of 700000 and 13085759, go to step 4. The installation of the High-Temperature Sensor will be at no cost to you. Owners of recalled refrigerators should NOT operate their refrigerator until it can be professionally repaired by your dealer or a Norcold authorized service center. Set the refrigerator controls to “OFF”. Unplug the refrigerator through the service vent on the outside of the vehicle. Contact your dealer, a Norcold authorized service center or Norcold’s Recall Center at 1-800-767-9101 as soon as possible to get assistance. Failure to follow these instructions can result in a fire causing injury or death. To locate an authorized service center, click the button below. Norcold, Inc. cannot accept responsibility if you do not immediately arrange to take your refrigerator into a Dealer/Service Center for repair. Moreover, you could be personally liable to third parties for property damage or bodily injuries resulting from your failure to have your refrigerator immediately repaired. Monday through Friday, 9 a.m. to 10 p.m. Eastern Standard Time. 1200, 1201, 1210 and 1211, 4 door refrigerators with cooling unit serial numbers ranging from 700000 to 13085759. These refrigerators were installed as original equipment in vehicle model years 1997 to 2010. Other recalled refrigerators may have been purchased as a replacement during the same period. N841, N821, N641, N621 and 1082 gas/electric 2 door refrigerators, having cooling units with serial numbers from 1038000 to 1099000. These refrigerators were mostly installed in, but limited to vehicle models from 1999 to 2000. Owners who have had the heater element replaced in one of these cooling units should call: 1-800-767-9101 to get their refrigerator upgraded to current product configuration. Due to a potential safety defect, Norcold has recalled the following smaller gas/electric refrigerator models, built from January 1987 through May 1995, listed below. If the serial number for your refrigerator model is within the specified range as listed below, the refrigerator’s gas valve needs to be remedied immediately. 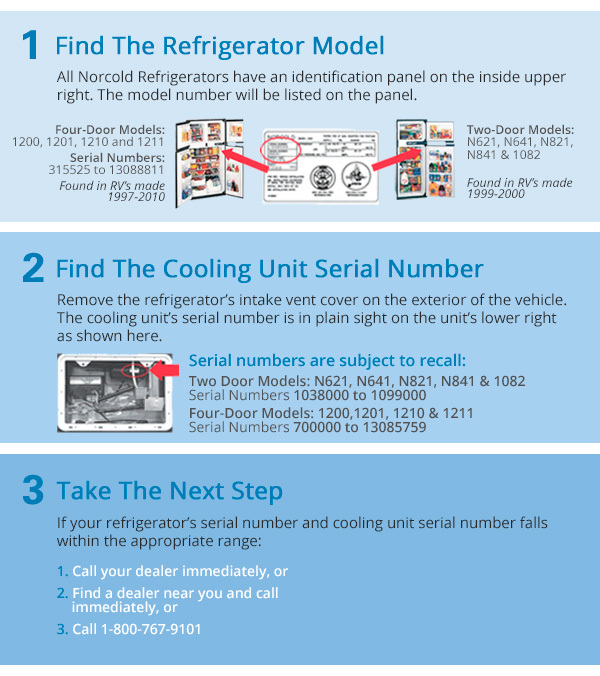 Refrigerator model and serial numbers can be viewed by looking on the inside right of your refrigerator cabinet. Continued propane gas mode operation of a refrigerator under this recall could result in a fire causing injury or death. Immediately switch your refrigerator’s controls to AC power (or DC power, if available, while in transit). No LP gas power operation should occur because it could create an unsafe condition. Contact a servicing Dealer/Service Center to arrange a service date soon. The gas valve in your refrigerator will be replaced at no charge. Contact a Dealer/Service Center to arrange a service date as soon as possible. A remedy kit, and the labor to install it, is free to the consumer. Call Norcold at 1-800-767-9101 with any questions, and to obtain the location of the nearest Norcold Service Center. Subject: Norcold recall, NHTSA assigned number 18E013, for models N305 and N306 refrigerators with serial numbers ranging from 27378283 to 28230836, non-consecutively. This notice is in accordance with requirements of the National Traffic and Motor Vehicle Safety Act and the Canada Motor Vehicle Safety Act. On March 7, 2018, Norcold announced and undertook a motor vehicle equipment safety recall (18E013) to address a potential safety defect at the propane gas valve on Norcold refrigerator model numbers N305 and N306 with serial numbers ranging from 27378283 to 28230836, non-consecutively, built from Sept. 15, 2017 to Feb. 15, 2018. The refrigerator’s serial number is located inside the fresh food compartment. Norcold determined that certain gas valves were exhibiting low flow and adjustments were being made to an unused connection on the propane gas valve of these refrigerators. This unused connection may have been loosened during the manufacturing testing process. Only operate the refrigerator on electric until recall service has been performed. Click here to see if a N305 or N306 serial number falls under this recall or check the status of a recalled unit. Click here for the Service Bulletin with detailed instructions how to access and tighten the unused connection on the propane gas valve on these refrigerators. Please contact Norcold’s Recall Center at 1-800-444-7210 (Option 1) with any questions. Total time allowance for the required recall service is 0.5 hours. All labor to inspect and tighten the unused connection on the propane gas valve is at no charge to the consumer. You will be reimbursed for the appropriate time at your standard labor rate. Here is the Claim Form. IMPORTANT: Some of the involved refrigerators may be in your vehicle inventory. Federal law requires the corrective action to be completed on these refrigerators before retail delivery. To identify if a refrigerator requires corrective action, verify the refrigerator model and the serial number as referenced above. You are prohibited from selling a product which has been identified by this corrective action campaign unless the product has first received the specified corrective action. Owner notification will begin in April of 2018. Owners were instructed to contact their RV dealer or a Norcold Authorized Service Center to arrange a service date. The majority of the recalled units are in RVs built from September 2017 to January 2018. We appreciate any assistance you could provide to help us notify the owners of vehicles built during this time frame. We appreciate your cooperation and assistance in conducting this safety recall. Our first priority is the safety of our products and the satisfaction of our customers. Please call 1-800-444-7210, Option 1, with any questions.